Chosen by the San Diego Chargers in the 2nd round of the 2001 draft, Brees spent a year as backup to veteran Doug Flutie before taking over as starting quarterback in ’02. A good first year as starter was followed by a season in which he had difficulties, and the Chargers swung the deal that brought rookie Philip Rivers to San Diego in 2004. Brees bounced back that year with a Pro Bowl season in which his passer rating was 104.8. 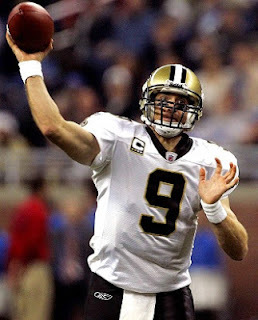 Brees badly injured his shoulder in the last game of the ’05 season, the final year of his contract, and with the team committing to Rivers, he signed with the New Orleans Saints. He was a consensus first-team All-Pro and was selected to the Pro Bowl in ’06, leading the NFL with 4418 passing yards and guiding the Saints, with a high-powered offense, to the NFC Championship game. Brees started poorly and the team didn’t do as well in 2007, but he recovered to lead the league in pass attempts (652) and completions (440) while throwing for another 4423 yards. Saints went 8-8 to finish fourth in the NFC South while leading the NFL in total offense (6571 yards), passing offense (4977 yards), scoring (463 points), and touchdowns (57). Brees and the Saints reached the top in 2009, with the quarterback leading the league in TD passes (34), completion percentage (70.6), and passing overall (109.6) while the club won the Super Bowl for the first time in franchise history. In 2010, Brees threw for 4620 yards and 33 touchdowns and led the NFL in completion percentage (68.1). However, he also threw a career-high 22 interceptions and, while the team qualified for the postseason as a wild card with an 11-5 record, the Saints were upset in the first round of the playoffs by Seattle. Brees set a new NFL record with 5476 passing yards in 2011 and topped the league in completions (468), completion percentage (71.2), and TD passes (46). He broke the record long held by Johnny Unitas for consecutive games with a touchdown pass in 2012, which finally ended at 54 straight, on his way to recording a third 5000-yard passing season (5177) and again topping the NFL in TD passes (43) although also in interceptions (19) in a difficult year for the club both on and off the field. Through 2012, he had completed 65.6 percent of his career passes for 45,919 yards and 324 TDs and had been selected to the Pro Bowl seven times. MVP Profiles features players who were named MVP or Player of the Year in the NFL, AAFC (1946-49), AFL (1960-69), WFL (1974), or USFL (1983-85) by a recognized organization (Associated Press, Pro Football Writers Association, Newspaper Enterprise Association, United Press International, The Sporting News, Maxwell Club - Bert Bell Award, or the league itself). Also includes Associated Press NFL Offensive and Defensive Players of the Year.